Six fresh spacecraft for Globalstar's mobile communications satellite fleet were deployed Wednesday by a Russian Soyuz rocket, propping up the company's degraded two-way voice service for more than 400,000 subscribers around the world. The successful launch continued Globalstar's campaign to replace aging satellites launched more than a decade ago. The satellites, each weighing 1,543 pounds at launch, will enter Globalstar's constellation circling a few hundred miles above Earth. Thales Alenia Space assembled the satellites in Rome and built their communications equipment in Toulouse, France. U.S.-based Globalstar Inc. provides mobile satellite telephone and data transmission services to customers in more than 120 countries. The Soyuz 2-1a rocket launched at 0227 GMT Wednesday (10:27 p.m. EDT Tuesday) from the Baikonur Cosmodrome in Kazakhstan, where it was 8:27 a.m. local time. After soaring into a cloudless blue sky, the Soyuz rocket's three core stages accelerated the six satellites to nearly orbital velocity, then a Fregat upper stage took over for two firings to inject the payloads at the correct altitude. The mission featured an upgraded version of the Soyuz booster including a digital control system, which allows the rocket to fly a larger 13.4-foot-diameter nose conse for commercial flights. The Fregat stage finished deploying the six Globalstar spacecraft as programmed at 0427 GMT (12:07 a.m. EDT). Two satellites mounted on top of the specially-built dispenser separated first, followed by the four other craft moments later. "The report from the satellite operations center is that all the satellites have been acquired," said Jean-Yves Le Gall, chairman and CEO of Arianespace, which managed the commercial launch through Starsem, a subsidiary jointly owned by European and Russian companies. The Soyuz rocket and Fregat upper stage placed the satellites in a 572-mile-high orbit with an inclination of 52 degrees. "I'm very proud to share this great achievement with all of you," Le Gall said in a post-launch statement. "This success was made possible thanks to the venerable Soyuz launch vehicle, whose flawless performance enabled this launch." The launch was delayed two days after the countdown was halted seconds before liftoff Monday night. One of the launch pad's umbilical arms failed to retract, but workers repaired the system in time for launch two days later. One of the satellites orbited Wednesday will immediately raise its orbit to an altitude of 878 miles and join Globalstar's operational fleet within 30 days of launch. The other five satellites will remain at their current altitude until they drift to their planned position within the company's constellation. Globalstar satellites are divided among eight orbital planes to evenly spread the spacecraft across the globe. 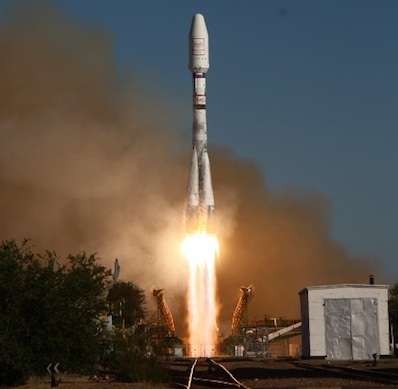 The Soyuz rocket's blastoff was timed to reach one of the orbital planes, where one of the satellites will enter service while the others drift to their ultimate locations. All six satellites will be in service within three-to-five months, according to Tony Navarra, Globalstar's president of global operations. Six other second-generation Globalstar satellites launched in October 2010 are now operational, Navarra said. One of the craft had to switch to a backup momentum wheel, triggering inspections of the next set of satellites, including a repair that caused a delay in the launch from the spring. The momentum wheel controls the satellite's orientation in space. Globalstar officials say the transition to the new satellite fleet will be seamless for the company's subscribers, except for a marked improvement in mobile two-way communications service. S-band antenna degradation on Globalstar's existing satellites has limited voice and duplex data communications since 2007. The problem has not affected Globalstar's simplex data relay and asset tracking product, according to the company. "We look forward to successfully orbit-raising these satellites so they can start improving the quality of our service, joining the rest of the six satellites from the previous launch in October and our first-generation satellites," said Vijaya Gallagher, the Globalstar 2 program manager. "We will start seeing immediate improvements in the duplex quality as well as simplex services for our existing customers as well as add new services very quickly." Globalstar subscribers use the satellite network to make mobile phone calls and data transmissions, especially in rural zones where terrestrial coverage is spotty or non-existent. Globalstar's existing constellation is mostly comprised of spacecraft launched between 1998 and 2000. Built by Space Systems/Loral and designed for a seven-and-a-half year orbital life, the satellites are aging and need to be replaced. Controllers are retiring the old satellites as fresh spacecraft enter service. The new satellites have a design life of 15 years. According to Navarra, two more Soyuz flights with six Globalstar satellites each are scheduled before the end of 2011. When the launch campaign is finished at the end of the year, Globalstar's satellite fleet will include 24 second-generation spacecraft and eight leftover first-generation satellites built as spares and launched in 2007. 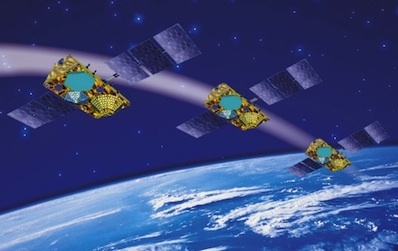 Navarra said Globalstar is now negotiating with Thales on a contract option for 23 additional satellites to be manufactured in the coming years. The spacecraft would be spares for the existing fleet and launched as needed, likely beginning in 2013 or 2014, according to Navarra. The current agreement between Globalstar and Thales provides for 25 satellites, including one ground spare.